Kicking around the traps since 2007, the ladies with the with the well-connected lineage - Cutbirth descends back to Daniel Boone, Lynn is the granddaughter of the iconic Loretta Lynn, and Wayne is John “Duke” Wayne’s granddaughter - are a fan friendly trio with a sure-fired style. Brought together initially to star in the reality-based ancestry TV show, All in the Genes, a show that didn’t see the light of day, didn't prevent the talented trio from finding their common ground in music. After a couple of singles (“He’d Better Be Dead” and “Paper Heart”), the ladies are strutting their stuff with the new single “Little Blue Sky”. Their recent press shares the enthusiasm: “We are so excited about getting this song out to our fans, friends and family” say the ladies who have opened shows for Tim McGraw and Lady Antebellum. 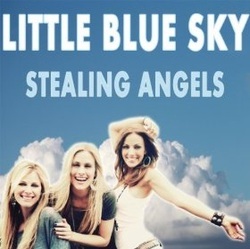 “It is really special to us because everybody has somebody who is their 'little blue sky'.